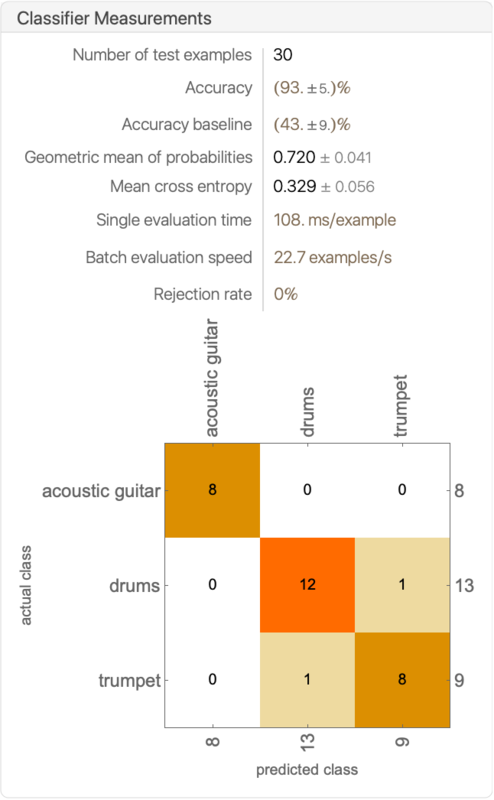 The Wolfram Language provides built-in support for both programmatic and interactive audio processing, fully integrated with other powerful mathematical and algorithmic capabilities. 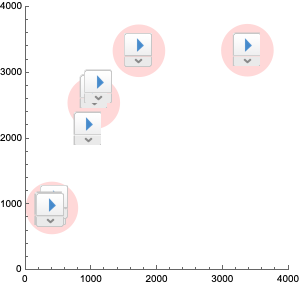 You can process audio objects by applying linear and nonlinear filters, add effects, and analyze them using audio-specific functions or by exploiting the extensive integration with the rest of the Wolfram Language. Audio signals can be used as input to many signal processing functions. Some of the filters that can be directly applied to audio objects. Many of the filtering functions present in the Wolfram Language can be immediately used on audio objects. In many cases, it is possible to specify the cutoff frequency as a frequency Quantity. Discrete-time transfer function models can be used to filter an audio object using RecurrenceFilter. Some of the available filter models and additional utilities. The simplest way to use one of the analog (continuous-time) filter models is to discretize the transfer function using ToDiscreteTimeModel and apply the result to an audio object using RecurrenceFilter. A discrete transfer function can be created using TransferFunctionModel and applied to an audio object with RecurrenceFilter. An audio object can be modified and manipulated using built-in or user-defined functions. Use pitch shifting and time stretching to independently modify pitch and duration of an audio signal. Delay and reverberation effects can be used to immerse a recording in a virtual environment or to produce special effects. Downmixing and upmixing to an arbitrary number of channels can be achieved using AudioChannelMix. It is possible to alter a recording by taking advantage of performing arithmetic operations on the Audio object. 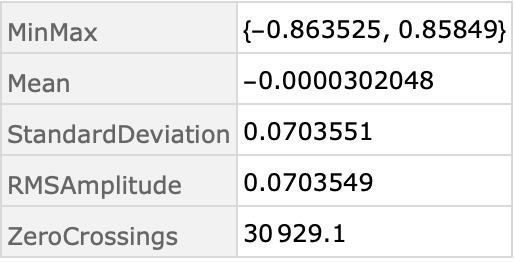 All Wolfram Language operators and functions with attributes NumericFunction or Listable are overloaded to work with audio objects. Properties can be computed on a recording both on a global and a local scale. Some of the functionality to compute global measurements. Both time domain and frequency domain properties can be measured with AudioMeasurements. The properties are computed on the average sample values over the channels of the audio object. 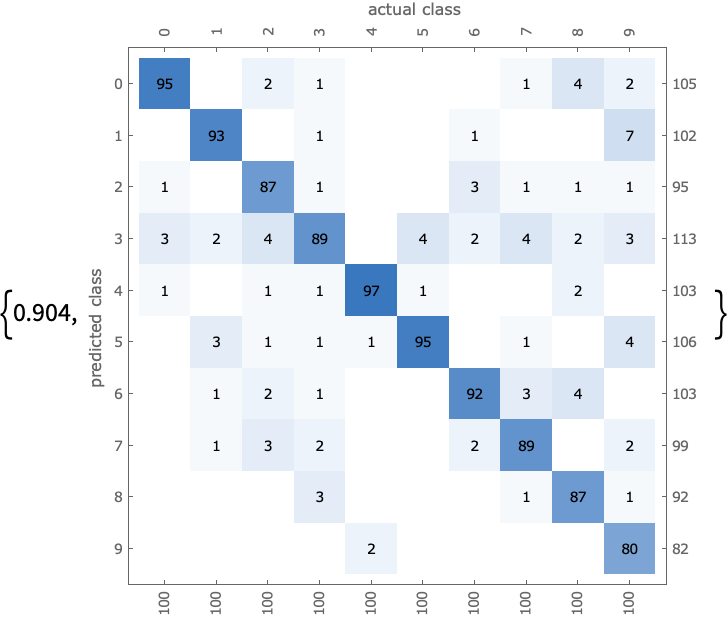 Compute other measurements by directly applying built-in statistical functions. 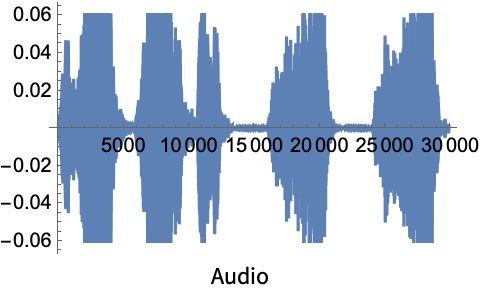 Unlike AudioMeasurements, overloaded functions are applied to the flattened version of the data. 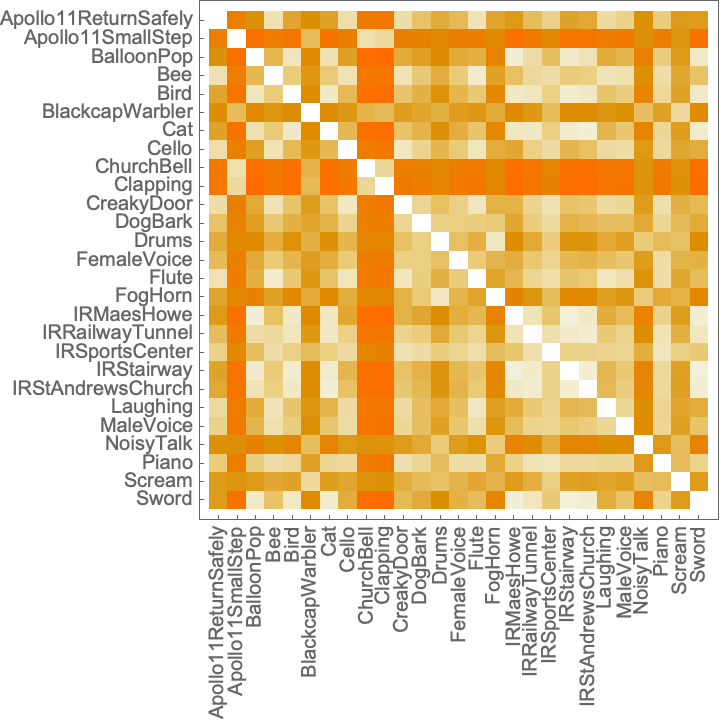 If the input is a multichannel audio object, the sample values from all channels will be flattened in a single array. 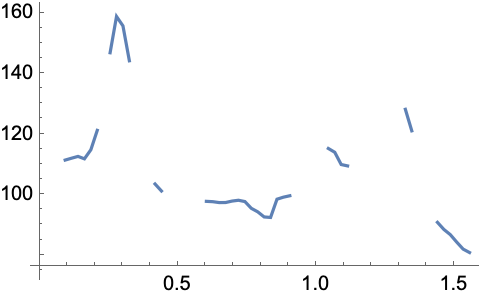 In addition to global properties of audio objects, it is also possible to compute measurements locally. Some of the functionality to compute local measurements.. In AudioLocalMeasurements, properties are computed locally. The signal is partitioned according to the PartitionGranularity specification, and the requested property is computed on each partition. 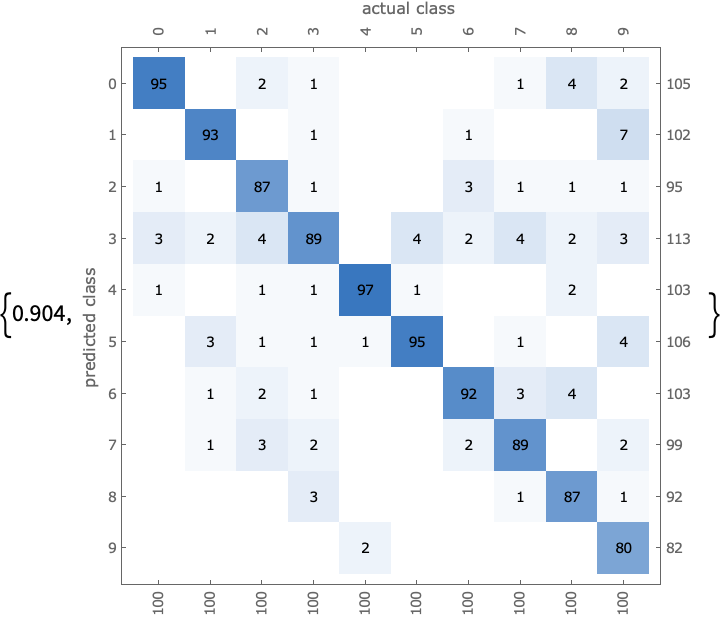 The result is returned as a TimeSeries whose timestamps correspond to the center of each partition. 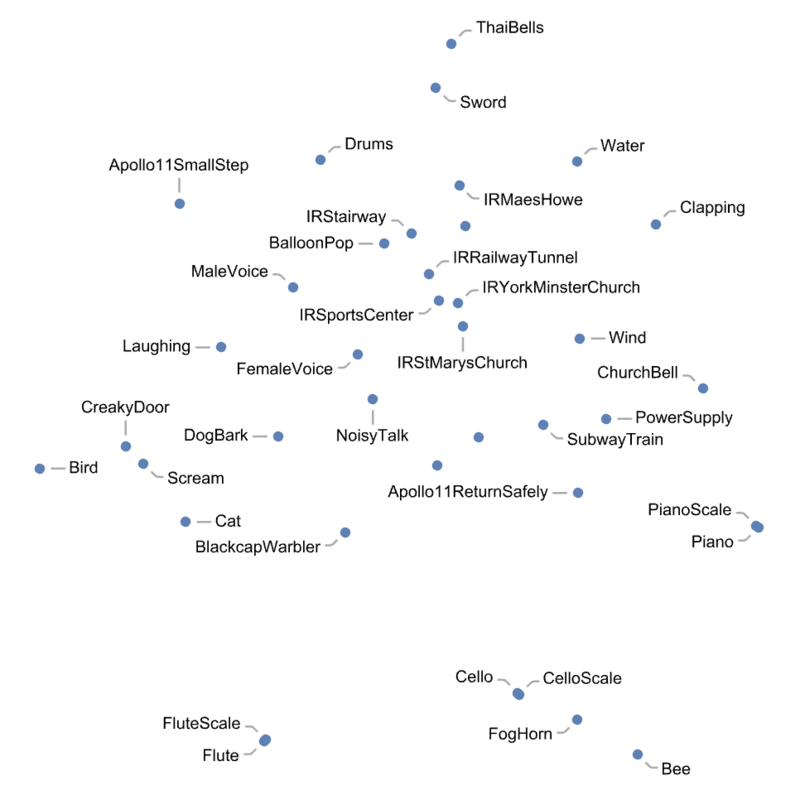 The result of AudioLocalMeasurements or AudioMeasurements can be used as an input for other functionality in the Wolfram Language. Using AudioIntervals allows you to extract intervals on which a user-defined criterion is satisfied. It is possible to use neural networks–based functions to gain a deeper insight into the contents of a signal. Some of the neural networks–based functionality. All the machine learning functions are aware of Audio objects and perform their computations starting with a semantically significant feature extraction. Some of the high-level machine learning functions. This preprocessing transforms each audio object in a fixed-size vector, so that they can be easily compared. Plot the features of a audio collection using FeatureSpacePlot. The Audio object is tightly integrated in the powerful neural networks framework. NetEncoder provides an easy entry point into neural nets for various high-level constructs such as the Audio object. Some examples of audio NetEncoder. Different encoders can be used to compute various kinds of features. 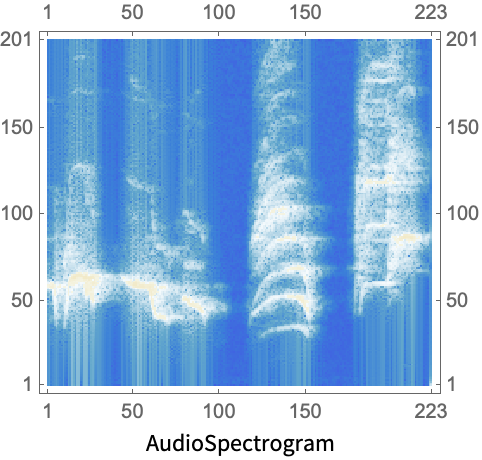 Some maintain all of the information of the original signal (like "Audio" and "AudioSTFT"), while others provide a compromise between discarding some information but dramatically reducing the dimensionality (like "AudioMFCC"). Using the encoders, it is easy to train networks from scratch to solve audio-related tasks and produce measurements of the resulting performance. 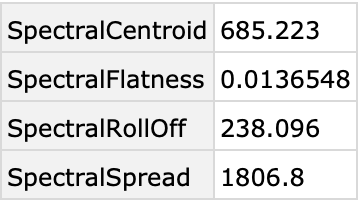 Some of the neural networks functionality. Use NetChain and NetGraph to create networks of arbitrary topology, and leverage sequence-focused layers such as GatedRecurrentLayer and LongShortTermMemoryLayer to analyze variable length signals.